The 2009 Tour de France didn't have a doping case until today, when a stage winner got nailed. It wasn't Lance. It was this guy. A great moment in front of my house this morning: Dad is teaching his tyke to ride a bicycle. The kid took time to say "cheese" in between his first attempts at pedaling a bicycle with training wheels. Check out the kids knee pads -- he's ready for any possibility. This morning I showed Bicycle Stories girlfriend the magic of the Fun-Lan Market at the 22nd Street drive-in and also the cargo-hauling power of my errand bike, a simple mountain bike I outfitted with two wide but smooth-tread tires and a sturdy rear metal rack that supports two big saddle bags for carrying all types of stuff. We found quite the bounty of goods at ol' Fun-Lan, including two giant jasmine bushes that Bicycle Stories girlfriend acquired for the front of the Bicycle Stories house. Check out the rig at full carrying capacity: The bike easily supported the two big jasmine shrubs atop the saddle bags that were filled with all types of fruits and vegetables. And to top that off, the cargo bike carroed two large jasmine bushes. The Tampa Tribune ran an editorial endorsing the repair and re-opening of the Friendship TrailBridge, endorsing many of the arguments SWFBUD put forth at public meetings two months ago. From the body language on the Tour de France podium Sunday, it was crystal clear that Tour de Lance and Alberto "The Pistol" Contador are not exactly pals. Alberto won the Tour for the second time in three years and Lance is a seven-time Tour champion, yet it was rather cool and icy on the podium when the first, second and third place awards were doled out. Then today, this story outlined the verbal sniping between Lance and Alberto. It's safe to say we've seen the last of these two fellas on the same racing team. I had a chance to steal a day in Key West with Bicycle Stories girlfriend and I was amazed at the rich bicycle life in Old Town. Key West easily wins best bicycle town in Florida if the criteria is a Florida community that most relies on bicycle transportation to get around. People had all types of utilitarian bikes, with tons of baskets hanging from just about every section of the bike. 1. Key West: Bikes are everywhere and cars respect them on the streets. They rule the place. 2. Boca Raton: I know, hard to believe that a suburban-style city is number two in Florida. But Boca Raton has a wonderful citywide bike lane network, including bike lanes on the five-mile segment on A1A through its city. 3. St. Petersburg: The Pinellas Trail extension, including bike traffic signals, is an infrastructure highlight in Florida. And the city has more plans for bike lanes and embraces bicycling. 4. Gainesville: I thought there would be more bicycle infrastructure in this college town, but so many people get around by bike here that it has to be a Top 4 bike town. OK, back to Key West and its bicycles. Did I say there are a lot of colorful bikes there? Some people ride their bike to work. This lady's ride is her work. Even the Mallory Square performers use bikes as props. For pure and cheap utility, the Key West bike rules. This was a typical one -- single speed, rusted chain and not much flash. But it gets the job done. Then, there's the quirky Key West bike, complete with parrot on handlebar and beads. Very cool bike rack to lock your bike. The low rider. There were several folks riding bicycle hogs. 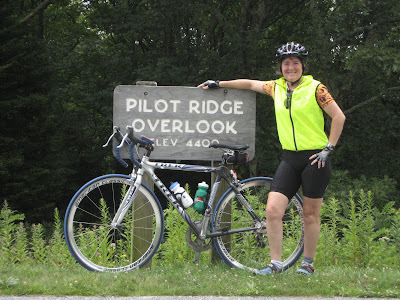 My pal Ellen is spending a few days in the Boone area of North Carolina and pedaling the lovely rollercoaster known as the Blue Ridge Parkway. 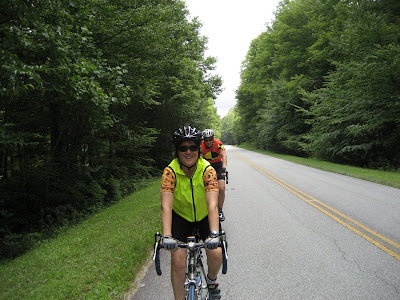 I was lucky enough to bike the Blue Ridge four years ago and can attest to the scenic beauty and hills. Ellen sends a few photos from her bicycle stay this week. Bicycle Stories reader Nick Griffiths, a Canadian and bike commuter who works at Moffitt, sends in this disturbing story about five bicyclists struck in a hit-and-run by a minivan in suburban Ottawa Sunday. Here's an interesting Web site for information on fudning bicycling and walking transportation projects. Wow, did you see Alberto Contador smoke the field in the Tour de France's alpine stage Sunday? Even Lance Armstrong had to admit that he doesn't mind being a domestique after Contador's performance.Armstrong moved up to second place overall in the standings after the 15th stage. 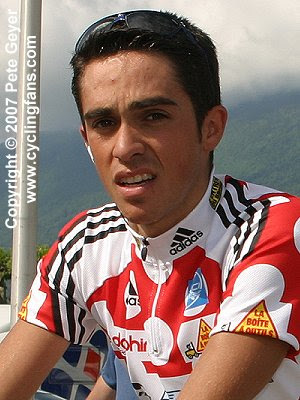 Looks like the Spaniard, who won the 2007 Tour de France, is poised to win in 2009. "As far as I'm concerned, I'm happy to be his domestique." "A day like this really shows who's the best, and I wasn't on par with what's required to win the Tour. So for me, that's the reality, that's not devastating news or anything." "I think being out for four years, and being one of the older guys out here, there might be people out there that expect me to ride like I did in 2004, 2005 — that's not reality. If I do another year, and I get a season under my belt, maybe we get that race condition back." After the Times' Jeff Klinkenberg wrote a terrific profile of veloman Chip Haynes of Clearwater, he travelled to Tallahassee to do a story on the bikini bicyclist. Today the Seminole Heights Bicycle Club did its fast 24-miler and a slower 12-miler. Here's the fast ride on Davis Islands near Tampa General Hospital. Jack "Ghost Rider" Sweeney and Ken Sturrock ride side-by-side as the fast ride caught up with the slow ride today on Davis Islands. Ken, who led the slower of today's rides, travels in style. The bicycle community showed a Tour de Force today as about 30 cyclists from SWAMP, BAADR, the Seminole Heights Bicycle Club and several bike shops biked to the Hillsborough County budget hearing to tell the county commissioners to keep Flatwoods and other parks open seven days a week. Our line of cyclists, which followed Hanna Avenue from Seminole Heights to the People's All Life Center, followed a five-mile route to the People's All Life Center on East Sligh Avenue. We picked up this cyclist on the way over. Here's Nancy, a cyclist from Temple Terrace, sharing the Save Our Parks message. Brian Eckman, owner of Carrollwood Bicycle Emporium, voiced his support for the park system, pointing out the business cyclists provide in Hillsborough County. I also interviewed Gary before the meeting and he explained how important the county parks are for cyclists. SWFBUD released the statement that will be read tonight at Hillsborough County's 6 PM budget hearing. It’s hard to convince bicyclists to attend a government meeting. They’d rather be out cycling. But dozens of bicyclists of all backgrounds are here tonight because Hillsborough County government is proposing to shut down for two days a week one of the natural gems of our county – Flatwoods county park and its adjoining park land. Very bad idea. Flatwoods is many things to many people. For many, the roads in Hillsborough County are poorly designed to host bicycle riders, so cyclists seek refuge on the 7-mile loop at Flatwoods. You will see everyone from youngsters to families to seniors, from bicycle novices to hard-core roadies pedaling the loop. You will also see hundreds of off-road mountain bikers on the Wilderness park land on trails built and maintained by local residents, not the county. Then there are the kayakers, and runners, and rollerbladers and hikers and anyone else who seeks a wonderful safe haven from the development that has sprawled throughout Hillsborough County. Then, we have another vital county resource – the Upper Tampa Bay Trail. The county has poured more than $20 million of infrastructure improvements into this trail that is used by families and cyclists of all backgrounds. 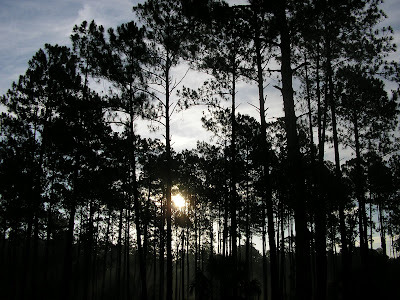 It’s foolish to think that you will truly “close” Flatwoods and the Upper Tampa Bay Trail. A mountain biker can easily bike in the woods at Flatwoods or a cyclist will enter the Upper Tampa Bay trail from many access points. You’re shutting down county resources at a time when bicycling is growing more popular as ever and these safe havens such as Flatwoods and the Upper Tampa Bay Trails offer a safe venue for inexperienced and new bicyclists to learn skills and gain confidence because we all know the roads in the county can be menacing for even experienced bicyclists. New bike shops are opening around the county. New bike clubs have been started in the past year. Your county residents are telling you in crystal-clear terms – give us safe and secure places to bike. It’s upsetting and regrettable that Hillsborough County chooses to decrease bicycle venue services while at the same time increasing pay for the assistants of County Administrator Pat Bean. Shameful and embarrassing, too. SWFBUD asks sternly to reverse the park closures of two days a week and re-examine and re-evaluate your proposed county budget to do just that. Why do people care about keeping Flatwoods open 7 days a week. Here's why. Budget Hearing Bike Ride leaves promptly at 5 PM from 5800 Central Avenue in Tampa. The SWFBUD Budget Hearing Bike Ride today will leave at 5 PM from in front of the garden center at 5800 Central Avenue. Please come early at 4:30-4:45PM and be ready to leave at 5 PM. I'm told Hillsborough County is expecting upwards to 1,000 people and security will be wanding people as they enter the All People's Life Center at 6105 East Sligh Avenue for the 6 PM public hearing. The Hillsborough County Budget Hearing scheduled for 6 p.m. on July 16 has been relocated to All People's Life Center, 6105 East Sligh Avenue in Tampa. This meeting location is changed from the 2nd Floor Board Room, with overflow on the 26th Floor Meeting Rooms A and B. The doors will open at 5 p.m. and security will conduct hand-wand screenings. General parking is available at King High School to the West and the ballfield to the East of All People's. Handicapped parking is available onsite, behind All People's. Busses can drop off their riders at the door and park at King High School. The gates at the King High School parking lot will be locked at 9:30 p.m. If residents can't make it to this site, they will still be able to watch the meeting live on Hillsborough Television (HTV) on Bright House channel 622 or Verizon and Comcast channel 22, or on the County's Web site at: www.hillsboroughcounty.org/budgetmatters through live streaming video. Residents will also still be able to submit questions or comments to a special email address: hcbudget@hillsboroughcounty.org; by using an online budget email form on the County's Web site; or by phone: (813) 307-8337. All comments and questions will still be relayed to the County Commissioners during the hearing, with some read out loud during the meeting as time allows. The County's budget is to be adopted on September 17. Today's SWFBUD Budget Hearing Bike Ride will leave promptly at 5 PM from in front of the garden center on Central Avenue. Please get there early and make sure you're ready to ride at 5 PM if you'd like to join the bike ride to the Hillsborough County budget hearing, where you can comment about the county's proposed budget, which calls for closing Flatwoods, the Upper Tampa Bay Trail and all county parks two days a week. Wanted: One elected county commissioner in Pinellas or Hillsborough county who has the balls to stand up for the people and move ahead in fixing the Friendship TrailBridge, or the old Gandy Bridge. Last night I attended a Friendship TrailBridge oversight committee meeting in Tampa and listened to dozens of people plead with the county commissioners who serve on the committee -- Al Higginbotham and Jim Norman from Hillsborough and Karen Bostock and Calvin Harris of Pinellas -- to vote and recommend that the counties apply for a $15 million federal stimulus grant to fix the bridge. Jim Norman wants both counties to beg Charlie Crist and the state Legislature for money to fix the bridge -- something that has been done before. Hardly new, Jim Norman. Here's a typical Jim Norman photo at the meeting -- he's looking bored listening to people tell their stories about how important the Friendship TrailBridge is to their lives. There's Jim with his chin cupped in his palm, thinking that he'd rather be watching Bucs highlights from their Super Bowl season. So in the end, the bi-county panel entrusted to make a recommendation made no recommendation and adjourned tonight. How's that for showing no leadership? Meanwhile SWFBUD stepped up. One of SWFBUD's eight bike shops -- Bicycle Outfitters of Seminole -- promised to donate 10 new bikes for rental purposes at the Fiendship TrailBridge for the use to make money for the bridge if the two counties fixed and re-opened the bridge, which has been closed since November. Let's see the county officials step up, too. See you at the Hillsborough County Commission Budget Hearing Thursday night at 6 PM at the People's All Life Center at 6105 East Sligh Ave. in Tampa. Mark Thornton, Hillsborough County's parks director, left a message on my cell phone today indicating he hopes local groups in the county will volunteer to help the county's parks stay open seven days a week after County Administrator Pat Bean proposed a budget that would shutter parks two days a week. Thornton also indicated there could be user fees at the parks -- along with the volunteers -- that would make up for the lack of funds to hopefully maintain the seven-day-a-week schedules at parks such as Flatwoods. I mentioned on WMNF, 88.5-FM, today that SWFBUD would be willing to consider those options if it comes down to keeping parks open seven days a week. The Hillsborough County budget hearing is 6 PM Thursday at the People's All Life Center next to King High School at 6105 East Sligh Ave. SWFBUD is leading a 5 PM bike ride to the county budget hearing, leaving from in front of the Seminole Heights Garden Center at 5800 Central Avenue. SWFBUD interviewed Pinellas County Commissioner Calvin Harris, who seemed supportive of fixing and re-opening the Friendship TrailBridge. Then, SWFBUD chatted with Hillsborough County Comissioner Al Higginbotham, who also sits on the TrailBridge committee. I just spoke on behalf of SWFBUD in favor of spending $15M to fix and re-open the TrailBridge instead of demolishing it for $13M. For the others packed here at the meeting, the Friendship Trail is a priority and people who are speaking are saying they want the money spent to re-open the bridge. The speakers are saying the health care angle is very important for users of the Bridge. Speakers are asking people to get involved to re-open the Bridge and for both counties to work together and come up with creative ideas for funding and potential revenue sources. They are opposed to tearing it down. One speaker can't understand how a person's weight can bring down the Friendship Trail Bridge. Another speaker joked that he gained 35 pounds since the bridge was closed since November. An engineer said the corrosion of the steel inside the concrete of the bridge would lead to the bridge collapsing. I'm blogging live from the Friendship TrailBridge meeting at the Weeden Nature Center in St. Petersburg regarding the future of the Friendship Trail. A committee of officials and citizens from both Pinellas and Hillsborough counties will hear a report, which says it will cost $15 million to fix the old Gandy Bridge that serves as the Friendship Trail. SWFBUD wants both counties to fix the bridge, which has structural problems. Both counties own the trail-bridge. $4 million was scheduled for improvements, but now there are four different options, including demolishing it for $13 million and fixing it for $15 million. Partial improvement and repair of the limited end portions is $10 million. New piers and bridge demolition would be $17 million. An engineer is giving a powerpoint to show the "internal structural defects" for the 1956 bridge. In 1995, the new bridge for westbound traffic opened. The TrailBridge is one of the longest pedestrian bridges over water in the world -- 2.6 miles long. Problem is there is deterioration -- and the powerpoint shows nasty cracks and deterioration in the beams and steel tendons. The bridge has been closed since November 2008. It's a packed house here in a meeting room, including Adam Beland, owner of Bicycle Outfitters in Seminole and Dottie Jessup of Chainwheel Drive in Clearwater. I'd say about 100 people are here. He's as much a part of the Tour de France as time trials, mountain stages, yellow jerseys and podium girls and is probably more recognizable to cycling fans than a majority of the riders in this year's race. He's Didi, the guy with that huge bike who dresses up like the devil and jumps up and down like a toddler throwing a temper tantrum. Even if you've watched little of the Tour over the past 16 years, you've probably seen him on the course, gesticulating wildly while holding his three-speared pitchfork. So who is he and, more importantly, what's his deal? They always called the final kilometre of a criterium [stage] the red devil's lap. I never saw a red devil, so I became one. Didi travels to most stages of the Tour with his enormous bicycles (he's listed in the Guinness Book of World Records as having built the largest bike) and sets up a few kilometers out from the finish. (He says he'd like to be closer to the finish -- or the red devil's lap -- but police and race organizers won't let him.) Sometimes he'll paint forks and cyclists on the road with white paint, but only if local police allow it. Then, he waits for the riders and chases them, but stresses that it's never intended to be bothersome. Sure it's not, Didi. He says he is able to pay for travel through sponsors and usually camps out in his car before each stage. A big tip of the bicycle helmet to my former college cycling pal David Regen, who sent me Jeff Mapes' book, Pedaling Revolutuion. I just got the book in the mail today and I'm looking forward to reading it this month. The Tour de France Month has folks pumped for cycling right here in Tampa Bay, from bike rides led by the Carrollwood Bicycle Emporium to a Tour de France BBQ party hosted by Seminole Heights Bicycle Club member Doug Jesseph on Saturday. Reminder of key meetings that affect bicyclists this week: Tuesday July 14 4 PM Weeden Nature Center in St. Pete about the Friendship TrailBridge; Wednesday July 15 7 PM Platt Library Manhattan Avenue in Tampa about the TrailBridge; Thursday July 16 5 PM SWFBUD Bike Ride to People's All Life Center 6105 East Sligh Ave. in Tampa for 6 PM Hillsborough County Budget Hearing on proposed parks cuts. Tune into WMNF Tuesday at 1 PM. I'll be on the air representing SWFBUD regarding the impact of Hillsborough County park budget cuts on bicyclists. Host Mitch Perry said he'll probably get around to SWFBUD around 1:20 PM. We all know that the county closing Flatwoods park two days a week is wrong, but SWFBUD also opposes Hillsborough County closing another valuable bicycle resource two days a week -- the Upper Tampa Bay Trail. The county has invested millions of dollars to build and improve the Upper Tampa Bay Trail, which SWFBUD hopes will be extended to connect into the Suncoast Trail. In fact, the county received DOT money (yes, Transportation funds) to improve the Upper Tampa Bay Trail's infrastructure such as the bridge above Gunn Highway because not only is this trail a recreational resource it also is a key TRANSPORTATION corridor for bicyclists, too. For the life of me I don't understand how Hillsborough County can "close" a massive stretch of land like Flatwoods or a trail corridor like the Upper Tampa Bay Trail and both are major regional resources that would make it foolish to close. So, SWFBUD asks you to oppose the closing of not only Flatwoods for two days a week but also the Upper Tampa Bay Trail, too. "As you probably are aware, the Friendship TrailBridge - formerly known as the "Old Gandy Bridge" - has been closed for safety reasons. The counties will soon decide whether to restore it or tear it down. "It can be saved. There is a very good chance of Pinellas and Hillsborough Counties tapping into a federal Department of Transportation $1.5 billion grant for restoring the Bridge. The Bridge qualifies for this funding grant. See article, below concerning details on the US DOT's TIGER (Transportation Investment Generating Economic Recovery) Grant. However, the counties need to hear from the citizens of Tampa Bay - do the citizens want to see the bridge torn down or restored? As a practical matter, if the bridge is torn down, you and I and the citizens of Pinellas and Hillsborough Counties will pay the bill with our taxpayers' dollars. Why not restore the Bridge with federal dollars - the TIGER Grant?" Reminder: Public meetings on the TrailBridge's future is July 14 and 15. This morning the Seminole Heights Bicycle Club set out for a 12-mile urban ride through downtown Tampa to Hyde Park Village and back, with a pitstop at the new City Bike Tampa downtown bike store in Tampa. Kellie Cyr talks with SHBC members about her new bike shop. There's Doug, who was pinch-hitting for Ken as today's ride leader. Downtown Tampa. Taking the lane on North Boulevard and taking it north to Seminole Heights. A no-look photo from behind captures big Ron Swiger. That's Rick Hickman, who helped get the club web site up and running. SWFBUD goes national again. This time, SWFBUD made Bicycling Magazine. Check out the current August edition of Bicycling with Lance on the cover and turn to page 30, the hubbub section. Halfway down the page SWFBUD makes an appearance, calling for governments in Florida to be proactive in preventing bicyclist fatalities. The back story: Several months ago I crunched the transportation numbers on the number of bicyclist fatalities by state in the US in 2007 and learned that Florida leads the country with the highest bicyclist fatality rate AND in the raw number of bicyclist fatalities (more than California, which has twice the population). I wrote a media release about my SWFBUD bicyclist fatality findings and Bicycling ran with it. Hillsborough County has switched the location of its July 16 budget hearing at 6 PM to the All People's Life Center at 6105 East Sligh Avenue. The SWFBUD Bike Ride will still be on for 5 PM, meeting on Central Avenue in front of the garden center at 5800 Central Avenue. The tentative route will be Central Avenue north to Hanna Avenue, and a right turn on Hanna for a straight beeline to 56th Street North. Then a left on 56th Street and a right turn on East Sligh. Meetings are July 14 and 15 for the Friendship TrailBridge. Alternative 1: $15 million - Repair entire structure. I'm told WMNF has been discussing the Friendship TrailBridge and bike trail issues during the middle of the day this week. Remember, big public meetings on the TrailBridge at the Weeden Nature Center in St. Pete on July 14 at 4 PM and at the Platt Library on Manhattan Avenue in Tampa on July 15 at 7 pm. Tell officials to fix the Friendship Trail and re-open it. Time: 8:00 A.M – 12:00 P.M.
Seminole Heights Bicycle Club has its 10/12-mile intermediate ride from Seminole Heights to Hyde Park and back on Saturday July 11, with a pitstop for snacks at the new downtown Tampa bike shop -- City Bike Tampa on Cass Street. Meet at 8:30 AM at the Garden Center at 5800 Central Avenue. This was passed on to me by SWFBUD member store Chainwheel Drive in Clearwater. "ACT NOW TO STOP YET MORE ROAD CROSSINGS FROM BEING BUILT ON PINELLAS TRAIL"
More road crossings to endanger us on Pinellas Trail? That's what will happen unless all bicyclists immediately contact government officials to stop a series of proposed road crossings and other takeaways that are planned for Pinellas Trail. Here's the deal. The City of Tarpon Springs, in conjunction with a developer, have approved a massive building project right next to Pinellas Trail about one half mile north of Klosterman Road. The project is called Meres Crossing and is slated to create new car crossings of the trail in several places. Meres Crossing has already resulted in the massacre of several acres of native Florida wetlands and woodlands right next to the Trail. This decimation has created severe flooding on the Trail which harms your ability to safely bike towards Tarpon Springs. Pinellas County officials have not so far stood up and opposed this takeaway, but there is still time to stop the development and the road crossings and to force the developer to mitigate the damage already done to the Trail by the flooding that the developer has caused. The developer should also be required to restore the viewshed so that the Trail again looks like it is in the middle of a forest, rather than as it is now, which is that it looks like it goes through the middle of a blasted out industrial park. Please call Trail Manager Lyle Davis at 727 453 3234, use the Pinellas County Commission comment form or phone number (http://www.pinellascounty.org/forms/contact-us.htm), and also contact area newspapers, television stations, bike clubs and other Pinellas Trail advocates to help stop any new road crossings on Pinellas Trail. Also advocate for making the developer pay for wetlands mitigation, trail flooding mitigation, and no more removal of native flora and fauna along the Trail. Pinellas Trail is already threatened because of budget cuts and past approvals of new roads without overcrossings, as well as new development. The time is now for us to contact county officials to encourage them to protect the Trail and stop the further ruination of this valuable bicycling resource. Sunday 7/26: "Mountain Stage" -- San Antonio hills ride. (map on cbebikes.com) meet at San An ballfields @ 7:15am - Roll out by 7:30am. We'll do a 36-40 mile loop at a B / B- pace and try to average 17mph or so. We won't "host" a post-ride party there since it's in a public parking area and everyone has to drive home, but there's a very nice deli / store just down the road that's great for an after ride sandwich and beverage. Bay News 9 included SWFBUD in its Monday report on the Hillsborough County proposed budget that calls for the county to close Flatwoods and nine other county parks two days a week. SWFBUD is leading a bike ride on July 16 to the county budget hearing at 5 PM and is asking people to bike with us to tell the county commissioners to keep Flatwoods open 7 days a week. Check out the live link to the Bay News 9 report.